There’s a little piece of Mars that I keep on a shelf at home, safely stored in a small plastic container, nestling in some cotton wool. It’s not very impressive, looking like a bit of gravel barely a centimetre across (see the photos below). Indeed it’s become less impressive in time, having been handled by more than 5,000 school kids, and also the Prime Minister’s Chief Science Advisor. In consequence it has become a bit grubby over the years. But it is indeed a piece of the planet Mars. One of my favourite ways of introducing it to any group is to hold it in one hand, whilst having a bite-sized Mars chocolate bar in the other. My question to them is obvious: “What do these two things have in common?” No-one has ever answered it correctly: they’re both small pieces of Mars. This has cost me a lot of mini-Mars bars over the years, but it was chocolate well-spent. I figure that for some pupils things like this – the day a scientist came to talk to us about space and gave us all Mars bars – might have the effect of making that little part of their schooling memorable. Whether that persuades them they’d like to be scientists, I worry not; the main thing is that they find something interesting (rather than reality TV and following social media websites, which means experiencing other people’s lives rather than their own). A little piece of Mars: a tiny fragment from the Zagami meteorite. • How did you get it? Bought it on the internet. • Is it valuable? Not really. A piece like this might cost you $100 nowadays. • Which spacecraft brought it back? None: we have never returned a sample from Mars. Yet. • Where did it come from, then? It’s a tiny chip from a meteorite called Zagami, which landed in Nigeria in 1962. The meteorite, weighing 18 kg and about the size of a football, landed a few metres from a farmer and punched a hole into the ground. • How do you know it really fell as a meteorite? Apart from the eyewitness report, the exterior has a characteristic black fusion crust formed when the original meteoroid entered the upper atmosphere at hypervelocity, losing much of its mass through ablation as it was decelerated before making a comparatively-soft landing. • How do you know it came from Mars? Although it’s a meteorite, it’s not like most meteorites, which are essentially fragments knocked off asteroids in the main belt between Mars and Jupiter. A petrologist would take a look through a magnifying glass and recognise Zagami as being made of basalt, which is a volcanic rock – and there are no volcanoes on asteroids. It must have come from a planet. 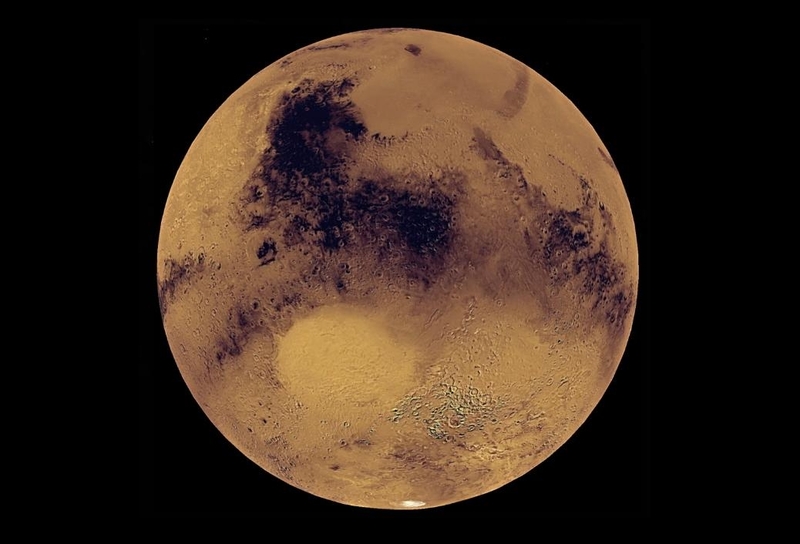 Whilst Zagami (and several other meteorites) were known for years to be oddities, it was not possible to demonstrate that they come from Mars until NASA’s Viking probes arrived there in 1976. Instruments on board those landers measured the composition of the Martian atmosphere in terms of both its chemistry and also the isotopic fractions of the elements present, these being essentially a unique fingerprint of the planet’s makeup. Tiny bubbles of gas preserved in meteorites like Zagami have that same isotopic composition. They must have come from Mars. Over 200 Martian meteorites are now catalogued. • How did it get to Earth? When large asteroids and comets impact Mars they excavate craters, throwing rocks out at high speed. Due to the low surface gravity of the planet and its tenuous atmosphere it is feasible that some of these rocks are ejected fast enough to escape Mars altogether, being inserted into orbits around the Sun from which they may eventually reach Earth. • How long did it take to get here? Theoretical orbital evolution studies indicate that the transit time – the time spent on free orbits around the Sun before arriving at Earth – is of order 10 to 100 million years. The space-exposure age of meteorites (the time spent in interplanetary space without the shielding provided by a planetary atmosphere) can be determined by counting cosmic-ray tracks in their surfaces, and the results are in accord with the above estimates. • From which other planets do we have free samples? There are also several hundred known meteorites that were thrown off the Moon by large impacts; we did not know this before the Apollo program returned more-expensive samples. Other peculiar meteorites are known about which there is ongoing debate concerning their origins. • What are you going to do with it? Keep it, and keep showing it to people so as to stimulate interest and prompt discussions. I like the thought of kids going home and telling their parents that they had a piece of the planet Mars in their hand at school today. I’d write more, but for now I am simply out of space.